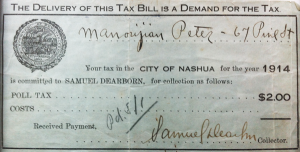 My mother’s cousin recently found their grandfather’s record of poll tax. My Armenian great-grandfather had fled the draft of the Ottoman Army and sailed to America in 1910. He arrived in Boston on February 6. The family story goes that he actually had no destination–just to get out of Ottoman-controlled Syria. He met a man on the boat who was going to Nashua, New Hampshire and knew of a shoe factory that was hiring. Bedros Manoogian followed this man to New Hampshire and worked in what our family story tells as a damp basement factory. He saved his money and sent it to his wife and young daughter that he had left back in Aleppo. 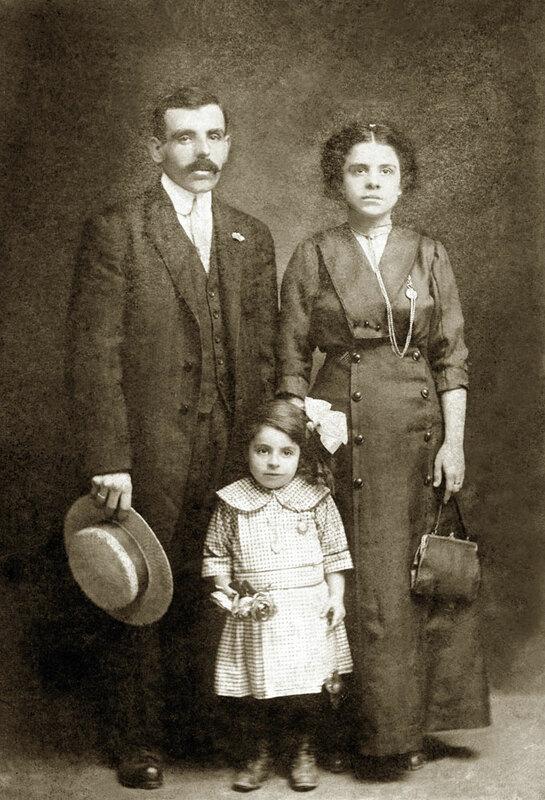 By 1914, his wife and daughter had come to America and their first American-born son was almost a year old. Based on this document, his name was already being Anglicized to “Peter”. He would have paid this tax to vote in the U.S. Senate and Congressional elections of 1914. New Hampshire reelected Jacob Gallinger that year. The $2 he paid in 1914 would be around $46 in 2012, per inflation. Bedros afforded this in 1914, but I wonder about several years later. By 1924, Bedros and his wife had 4 children, that damp basement had made him sick (which led to TB) and unable to work. His 13 year old daughter had to quit school to help support the family. Could they have afforded a poll tax then? If not, does that mean they did not deserve the right to vote? Poll tax came about as part of the Jim Crow laws. They were created to disenfranchise. The 24th amendment to the Constitution got rid of the poll tax for federal elections and most states ratified it by the mid-sixties. Ironically, and of course why the timing of this is so interesting, New Hampshire has enacted a voter id law this year. I believe that voter id laws are nothing more than poll tax in disguise, enacted for the very same reasons. One argument is that they help cut down on voter fraud. A recent study found that a person is more likely to be hit by lightening than commit voter fraud, so I don’t buy it. The AAUW has a great blog postabout why voter id laws are bad. Meanwhile this post is about Bedros Manoogian, using some of his hard earned money to make sure he could cast his vote. Unfortunately he died quite young (the TB mentioned above), so none of us know what importance this held for him. This was a man who had named his first child Azadhui (“freedom”), as she was born right after the Young Turk revolution had given Armenians hope for equality. Of course within 2 years those hopes were dashed and he fled. I can only imagine that he really valued the ability to vote for those who would lead his new country.